Mega-DHA / 60 Softgels - Nature's Way®. Nature's Way EFAGold® Mega-DHA is a high quality source of DHA - guaranteed to contain 50% Docosahexaenoic acid (DHA) and 20% Eicosapentaenoic acid (EPA) from premium fish oil that is distilled for purity and tested for PCBs, heavy metals (including mercury) and other impurities. 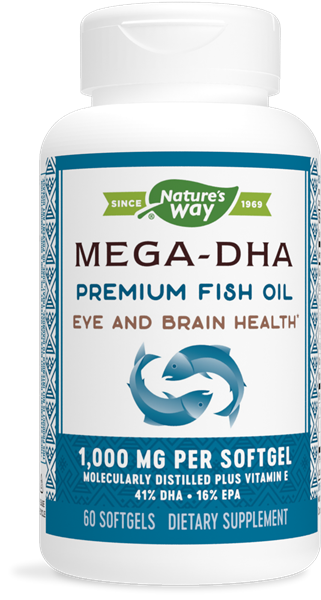 Mega-DHA is a super concentrated 50% DHA fish oil in a convenient 1,000 mg softgel. Each softgel provides 500 mg of DHA, 200 mg EPA, and 10 IU of Vitamin E.
DHA is an essential Omega-3 fatty acid for healthy mental and visual function. * Mega-DHA is ideal as a prenatal and nursing supplement. DHA is also essential to proper eye and brain development within infants (before and after birth)*. Mega-DHA can replenish DHA in the mother or can be used to support healthy skin, eyes, joints and brain function. * Studies indicate the average Western diet is low in Omega-3 fatty acids, including DHA. Molecularly distilled. Tested for PCBs, heavy metals (including mercury) and other impurities.